New Melones Lake is currently holding 515,711 acre-feet of water. The lake level came up just a little this past week and should start to rise quickly with the recent and upcoming rainfall. It is currently at 861 ft. above sea level and 224 ft. from full. The water clarity is clear in most of the lake with a slight stain in some areas. The water temperature is cooling, with the average being 57-62 degrees. The concrete ramp is CLOSED and should re-open once the lake reaches 865 ft. There is also a courtesy dock on the dirt launch which will be in place until the concrete ramp is open again. 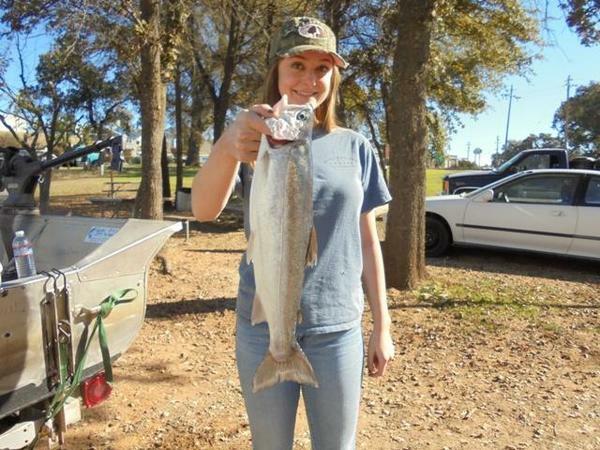 Katherine Stearns of Sonora caught a nice 1-pound, 11-ounce rainbow trout. She reported catching it on a Speedy Shiner near the dam. This past week we got to see some more of those impressive New Melones rainbow trout. The water temperature continues to cool and each week more fish will move toward shallow water. The shad have been schooling in deep water and will also start to migrate toward shallow water, coves and creek channels. The trout will follow. Trolling anglers have been targeting deep water from 80'-100'. Some anglers have also been finding fish top-lining and fishing with leadcore line. The deep water anglers have been catching fish on the main lake between the dam and the spillway. The shallow water anglers have been finding fish upriver and in the major creek channels. A few different setups are catching these 2 to 5-pound rainbows. Most anglers are using shad patterned spoons and brightly painted Rapalas. Bank anglers are starting to pick up a few fish on Power Bait or a mallow/crawler combo. Generally the bite will turn on around Thanksgiving weekend. Some trout are cruising just under the surface and can be caught with a bubble and fly rig. 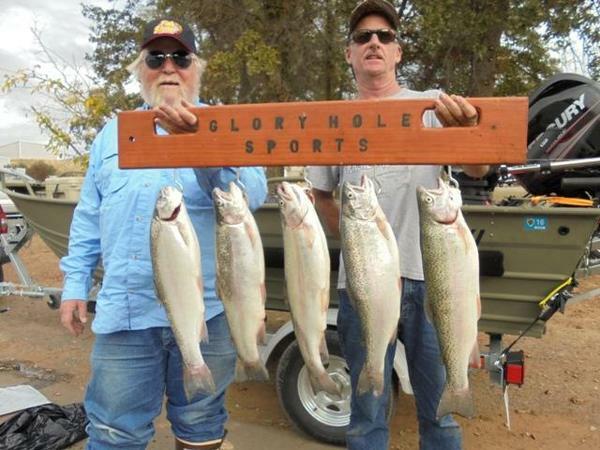 Glory Hole Sports Big Fish of the Week goes to Frank Curcuro of Sacramento. He caught a 3-pound, 15-ounce trout while trolling a shad patterned Rapala on the main lake. 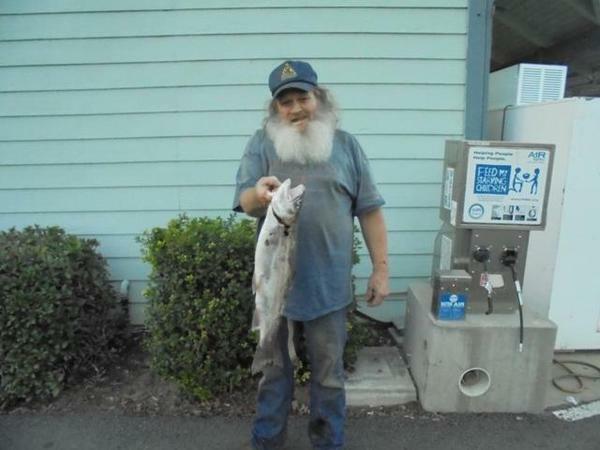 Rod Smith of Sonora caught a nice 2-pound, 12-ounce rainbow trout while trolling an Excel Spoon. Many bass anglers have been doing a little better as the fish transition to a fall-like pattern. The bass will feed heavily in preparation for the cold winter months to come. The shad are constantly on the move and the majority of bass are following them around the lake. There are areas that will be loaded with fish and then be vacant a few hours later. The key is to make multiple stops in search of actively feeding fish. The productive depth seems to be 35'-45'. Look for areas that the bass will push and ambush bait. Shad patterned worms fished on a darthead or shakeyhead will work well. Many fish are suspended and swimming a single tail grub in the middle water column will trigger strikes. Some fish will completely ignore the schools of shad and strictly target crawdads. Plus, fish are opportunistic feeders and will pick up a crawdad even if they are in the process of busting shad. This makes a football head jig a good choice. Use light jigs in shallow water and heavier jigs as you work out deep. Keeping contact with the bottom is very important when fishing a jig. ¾-ounce jigs in 45' of water will trigger bites from now until spring. Use natural colors and switch trailer until the fish tell you what they prefer. PLEASE PRACTICE CATCH AND RELEASE. Take photos and carefully release the fish back into to the lake to maintain a healthy fish population for generations to come. We are half way through our Glory Hole Sports Fall Catfish Contest. It has been a slow start, leaving the door wide open for anyone to win. We have just a couple more spots to fill to reach a full 50-contestant field. It's just a matter of time before we start to see some of those giant catfish that New Melones has to offer. Many fish can be caught using different baits. Frozen shad are a go-to when it comes to fishing the Mother Lode reservoirs. The bass and trout will crash through schools of shad leaving many wounded and dead. Those shad will settle on the bottom and the catfish will come through and clean up. The shad are moving shallow and toward the backs of creek channels, many large catfish will follow. Catfish will also feed primarily by scent. Stink baits and dough baits can be fish alone or with other baits to attract fish. The wind and current will disperse scent and draw fish to your presentation. Nightcrawlers and chicken liver are proven catfish catchers. Glory Hole Sports Big Fish of the Week Contest goes to Ben Chavez of Angels Camp. He caught an 8.27-pound catfish while soaking shad in 50' of water.